Hang Your Gong running medal hangers with a male or female runner above the hanger bars. Unique black steel designs for hanging your medals. Both designs available in standard or large. Hang Your Gong medal hangers with a MY MEDALS text message above the hanger bars. Unique black steel design for hanging your medals. 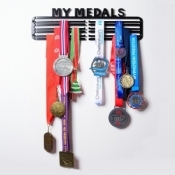 Ideal standard or large medal hangers for a true multi-sports athlete and for celebrating non-sporting achievements.